Intelligence hardly guarantees holiness. 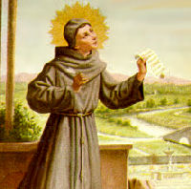 But John Duns Scotus was not only brilliant, he was also humble and prayerful—the exact combination St. Francis wanted in any friar who studied. In a day when French nationalism threatened the rights of the pope, Scotus sided with the papacy and paid the price. He also defended human freedom against those who would compromise it by determinism. Ideas are important. John Duns Scotus placed his best thinking at the service of the human family and of the Church. A humble man, John Duns Scotus has been one of the most influential Franciscans through the centuries. Born at Duns in the county of Berwick, Scotland, John was descended from a wealthy farming family. In later years he was identified as John Duns Scotus to indicate the land of his birth; Scotia is the Latin name for Scotland. John received the habit of the Friars Minor at Dumfries, where his uncle Elias Duns was superior. After novitiate John studied at Oxford and Paris and was ordained in 1291. More studies in Paris followed until 1297, when he returned to lecture at Oxford and Cambridge. Four years later he returned to Paris to teach and complete the requirements for the doctorate. In an age when many people adopted whole systems of thought without qualification, John pointed out the richness of the Augustinian-Franciscan tradition, appreciated the wisdom of Aquinas, Aristotle and the Muslim philosophers—and still managed to be an independent thinker. That quality was proven in 1303 when King Philip the Fair tried to enlist the University of Paris on his side in a dispute with Pope Boniface VIII. John Duns Scotus dissented and was given three days to leave France. In Scotis’s time, some philosophers held that people are basically determined by forces outside themselves. Free will is an illusion, they argued. An ever practical man, Scotus said that if he started beating someone who denied free will, the person would immediately tell him to stop. But if Scotus didn’t really have a free will, how could he stop? John had a knack for finding illustrations his students could remember! After a short stay in Oxford he returned to Paris, where he received the doctorate in 1305. He continued teaching there and in 1307 so ably defended the Immaculate Conception of Mary that the university officially adopted his position. That same year the minister general assigned him to the Franciscan school in Cologne where John died in 1308. He is buried in the Franciscan church near the famous Cologne cathedral. Drawing on the work of John Duns Scotus, Pope Pius IX solemnly defined the Immaculate Conception of Mary in 1854. John Duns Scotus, the "Subtle Doctor," was beatified in 1993.